Hallux rigidus is a common condition involving pain and limited range of motion to the first metatarsophalangeal joint (MPJ) with degenerative arthritis of the joint. Conservative treatments include activity modification, stiff-soled shoe gear, orthotics, non-steroidal anti-inflammatory drugs (NSAIDs) and cortisone injections. We can group surgical procedures for hallux rigidus into either joint sparing or joint sacrificing procedures. Joint sparing procedures include cheilectomy, soft tissue interposition, phalangeal osteotomy and shortening first metatarsal osteotomy. Joint sacrificing procedures consist of prosthetic arthroplasty and arthrodesis. Traditionally, dorsal MPJ cheilectomy is indicated when there is mild to moderate joint damage and pain is limited to end range of motion. First MPJ arthrodesis has been the standard surgical procedure for end-stage disease and when pain is present throughout range of motion. While arthrodesis is a definitive procedure that resolves pain, it does have potential disadvantages as far as joint preserving procedures. Complications include malunion, nonunion, shortening of the first ray, lesser metatarsalgia and prolonged recovery time. In a literature review of 2,818 first MPJ arthrodesis procedures, Roukis found a nonunion incidence of 5.4 percent, a malunion rate of 6.1 percent and an 8.5 percent incidence of hardware removal.1 Another important consideration is patients’ concern for losing motion at the great toe joint and how it will impact their lifestyle. 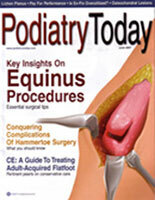 Advances in surgical technology and techniques have led to more options for advanced stage hallux rigidus procedures that maintain motion at the first MPJ. Coughlin and colleagues compare patients who had either a cheilectomy or a first metatarsophalangeal joint arthrodesis.2 They describe their grading system and criteria for discerning which patients will have the best outcome for a cheilectomy versus arthrodesis of the first MPJ. The authors recommend cheilectomy for all patients with grade I-II and arthrodesis for all patients with grade IV. However, for patients classified as grade III, one should determine the procedure on an individual basis. Coughlin and colleagues reported on 110 patients with 80 feet receiving cheilectomy and 30 feet undergoing arthrodesis.2 The mean follow-up time was 9.6 years after cheilectomy and 6.7 years after arthrodesis. The surgical procedure for cheilectomy included removing 25 to 33 percent of the metatarsal head dorsally along with any medial and lateral osteophytes. Surgeons then applied bone wax to the dorsal aspect of the first metatarsal head over any exposed bone. For the arthrodesis patients, they placed the hallux in 15 degrees of valgus and 20 degrees of dorsiflexion in axis to the first metatarsal. They then fixated the arthrodesis site with dorsal plating. The authors found that at 9.6 years postoperatively, 8 percent of the cheilectomy procedures had failed and gone on to further surgical intervention.2 They also found that 94 percent of the arthrodesis patients had fused without complication. In the study cohort, the nine patients with grade IV hallux rigidus uniformly failed cheilectomy and went on to either arthrodesis, or continued pain and poor outcome. The study noted that patients with grade III hallux rigidus and less than 50 percent of viable cartilage (as visible intraoperatively) had greater rates of failure. The historical poor surgical outcome of cheilectomy for patients with high grade hallux rigidus has led surgeons to pursue new surgical techniques that maintain first MPJ motion. O’Malley and colleagues published results on 81 patients with advanced hallux rigidus in the first MPJ who had a cheilectomy with extension osteotomy of the proximal phalanx.3 The patient population consisted of 31 patients classified as having Grade III hallux ridigus and 50 patients classified as having Grade IV hallux rigidus. The mean duration of follow-up was 4.3 years. The procedure was a dorsal cheilectomy, removing the dorsal one-third of the first metatarsal head along with any osteophytes.3 Surgeons performed a 3 mm dorsal closing wedge osteotomy of the proximal phalanx approximately 8 mm distal to the first MPJ. The plantar cortex remained intact and surgeons fixated the osteotomy with a 2 mm screw. The postoperative protocol included immediate weightbearing in a surgical shoe with patients transitioning to regular shoe gear at three weeks as tolerated. The authors found a significant mean increase of passive dorsiflexion of 27.0 degrees and increase in the American Orthopaedic Foot and Ankle Society (AOFAS) score from 67.2 to 88.7 at the last follow-up. They found that four of the 81 (4.9 percent) patients required revision to arthrodesis. Unfortunately, there is no additional published data to support the use of cheilectomy and proximal phalangeal extension osteotomy for the treatment of advanced hallux rigidus. Despite the promising results of the study, O’Malley and colleagues continue to recommend arthrodesis for patients who present with little or absent first MPJ motion. For patients with absent first MPJ motion, advances in arthroplasty techniques and prosthetic technology have provided viable options for patients in whom a joint sacrificing procedure is typically indicated. There has always been concern regarding the longevity of the prosthetic utilized for either total arthroplasty or hemiarthroplasty. Potential complications of implant arthroplasty include joint stiffness, continued pain, prosthetic loosening and prosthetic subsidence. Other concerns with implant arthroplasty are the loss of viable bone and increased difficulty if a revision surgery is necessary. There is increasing literature to support the use of metatarsal head resurfacing for advanced hallux rigidus as an alternative to arthrodesis. Kline and colleagues recently reported on a five-year follow-up of 30 patients first MPJ arthroplasty with HemiCAP (Arthrosurface).4 The prosthetic is designed to resurface the damaged articular surface of the metatarsal head. All the patients included in the study were classified as either having Hattrup and Johnson grade II or grade III hallux rigidus. The surgical procedure includes first MPJ exposure through a dorsal capsulotomy followed by an aggressive soft tissue release. Soft tissue release includes collateral ligaments, the sesamoid sleeve and the fibrotic flexor brevis tendon insertion.4 Then place a guide pin down the first metatarsal shaft and ream the metatarsal. Then size the implant and position it over the distal metatarsal surface. The authors then interpose a sleeve of extensor digitorum brevis if more than 50 percent of the cartilage on the phalangeal base shows significant degeneration. One would instruct patients to ambulate as tolerated postoperatively. Utilizing physical therapy can facilitate aggressive work on joint mobility. The patients had follow-up at a mean of 27 and 60 months.4 The authors found significant improvement at 27 months in range of motion and AOFAS scores (from 51.5 to 94.1). Visual Analog Scale (VAS) pain ratings improved from 6.8 to 1.4. At the 60-month follow-up, they found a mean AOFAS pain score of 80 percent and a mean AOFAS activity score of 80 percent, indicating no limit to daily activities and only slight limitation in recreational activities. There was no radiographic evidence of implant loosening, subsidence or disengagement. There was also no evidence of periprosthetic radiolucency consistent with implant wear. They reported an implant survivorship of 87 percent at five years. They had to revise three patients to a silastic implant and convert one to a primary arthrodesis. The use of interpositional bone graft was not necessary for the arthrodesis. The authors state that the revision cases were for the treatment of phalangeal pathology and were not related to prosthesis failure. The midterm results reported are very promising for the use of first metatarsal head resurfacing prosthesis as an alternative to arthrodesis for advanced hallux rigidus. One of the most appealing attributes of the HemiCAP prosthesis is minimal resection of bone if revision surgery becomes necessary. Other arthroplasty options include the use of first MPJ capsular tissue, tissue allograft tendon and meniscus allograft. The majority of literature regarding allograft arthroplasty is limited to small case series that lack long-term follow-up. DelaCruz and coworkers published a retrospective review of 12 patients (13 total procedures) who had cadaver meniscus allograft interposition arthroplasty for salvage of late-stage hallux rigidus.5 They found first MPJ joint dorsiflexion improvement from 15.77 degrees (a range of 5 to 30 degrees) to 47.77 degrees (a range of 40 to 57 degrees). They also found improvement in AOFAS scores from 52.54 points (a range of 35 to 69) to 90.01 points (a range of 82 to 95). The mean length of follow-up was 16.46 months. The authors reported no complications and stated that cadaver meniscus allograft interposition is a viable procedure for end-stage hallux rigidus. Coughlin and coworkers published a smaller case study of seven patients with an average follow-up of 42 months following the use of an allograft tendon bundle as a biologic spacer for interposition arthroplasty.6 The authors reported that at the final follow-up, all seven patients rated their result as good or excellent. They also found the mean AOFAS score improved from 46 to 86 points. They did note that four patients reported mild metatarsalgia characterized by mild plantar callosities. Despite the advances in surgical techniques and technologies for preserving first MPJ motion, there is little high quality published data at this time. At our institute, we have a large patient population that present with advanced stage hallux rigidus. The majority of these patients are either young athletes or females who are hesitant to pursue arthrodesis of the first MPJ. There is general concern about the impact of arthrodesis on their athletic performance and limitations in shoe options. When discussing surgical options with these patients, it is imperative to consider each patient’s expectations and desired postoperative activities. For patients who pursue joint salvage procedure, we typically perform an aggressive cheilectomy. We add an amniotic tissue membrane to the dorsal surface of the first metatarsal head and extend it into the first MPJ. We have found that the addition of amniotic membrane and aggressive postoperative physical therapy have improved postoperative outcomes and joint range of motion. While there has been significant improvement in surgical options that maintain first MPJ motion for advanced hallux rigidus, always discuss with the patient that a revision surgery may be necessary. Dr. Campbell is a is a faculty member of the University Foot and Ankle Institute and practices in the Santa Barbara office. 1. Roukis TS. Nonunion after arthrodesis of the first metatarsal-phalangeal joint: a systematic review. J Foot Ankle Surg. 2011; 50(6):710-3. 2. Coughlin MJ, Shurnas PS. Hallux rigidus. J Bone Joint Surg. 2003; 85(11):2072-2088. 3. O’Malley MJ, Basran HS, Gu Y, Sayres S, Deland JT. Treatment of advanced stages of hallux rigidus with cheilectomy and phalangeal osteotomy. J Bone Joint Surg. 2013; 95(7):606-610. 4. Kline AJ. Hasselman CT. Metatarsal head resurfacing for advanced hallux rigidus. Foot Ankle Int. 2013; 34(5):716. 5. DelaCruz EL. Johnson AR, Clair BL. First metatarsophalangeal joint interpositional arthroplasty using a meniscus allograft for the treatment of advanced hallux rigidus: surgical technique and short-term results. Foot Ankle Spec. 2011;4(3):157-64. 6. Coughin MJ, Shumas PJ. Soft-tissue arthroplasty for hallux rigidus. Foot Ankle Int.